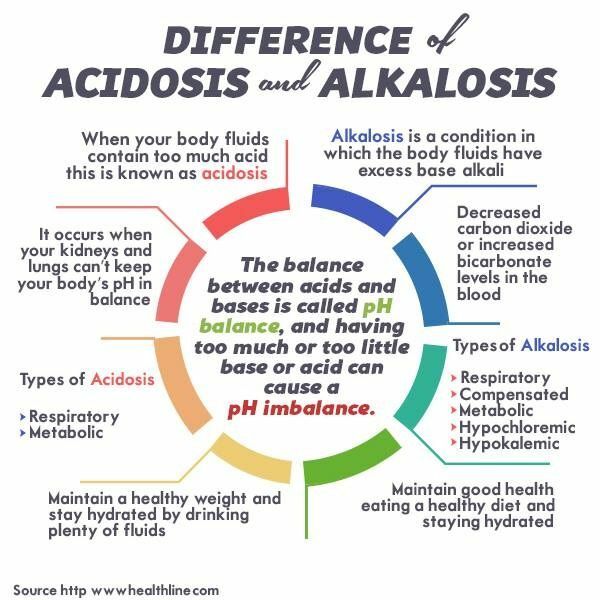 Summary: Difference Between Acidosis and Alkalosis is that Acidosis is the reduction in pH (increase in H+ concentration) below normal range. While Alkalosis is the increase in pH (decrease in H+ concentration) above the normal range. Decrease in HCO3 – concentration. Increase in HCO3 – concentration. Since the partial pressure of CO2 (pCO2 ) in arterial blood is controlled by lungs, the acid-base disturbances produced by the change in arterial pCO2 are called the respiratory disturbances. Metabolic acidosis is the acid-base imbalance characterized by excess accumulation of organic acids in the body, which is caused by abnormal metabolic processes. Organic acids such as lactic acid, ketoacids and uric acid are formed by normal metabolism. The quantity of these acids increases due to abnormality in the metabolism. Metabolic alkalosis is the acid-base imbalance caused by loss of excess H+ resulting in increased HCO3 – concentration. Some of the endocrine disorders, renal tubular disorders, etc. cause metabolic disorders leading to loss of H+. It increases HCO3 – and pH in the body leading to metabolic alkalosis.